Top tips for desk perfection! 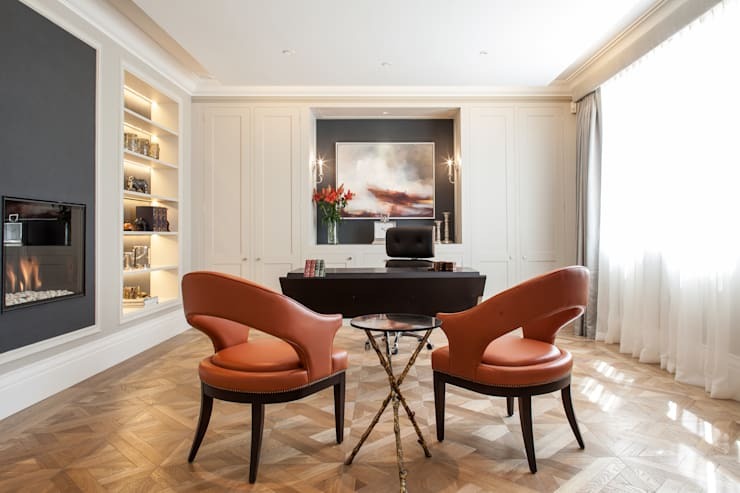 Whether you are working from home in a designated office space or still looking around for that perfect quiet corner to get some much needed work done, there are some golden rules to placing your desk in the perfect position. Although freelancers and entrepreneurs often get the bulk of their work done when the kids are at school and their partner is at work, but this doesn't mean that creating a space that is great for working is easy. Inspiration comes in many forms, from a cool breeze outside to a vibrant colour that you just happened to see in the chaos. The homify team has compiled this Ideabook to address your home office situation! Let's find out how to get your desk in the spot that will be most conducive to productivity! One of the cardinal rules for desk placement is to consider the natural sunlight spot. Facing a wall is not great for an optimal working situation, so if you have the good fortunate to face a garden with grassy green lawns or maybe some fantastic flora, then that should be the best spot for your desk! However, if there is nothing much inspiring outside, it may still be worth it to face the window, natural sunlight and fresh air does wonders for the human body! Maybe add some fresh flowers on your desk if you are starved for natural beauty! If your work is somewhat sensitive or private then it may be best to ensure you do not have the door behind you. This makes it easier for someone to creep up behind you and read your work. Have the door in your line of sight, you will be able to monitor who comes in and out of your work space this way. Also, the door behind you means that when colleagues or potential clients visit, they won't be seeing you face to face at first, especially if someone is introducing you to them. So it's best to place your desk in the most strategic spot in your home office. Always be ready to expect guests. Have some comfortable seating on the opposite side of your desk with a small coffee table too. This will make guests feel at ease when they visit you at your office and if they are done with their refreshments, there's even a place to put their empty cups without being awkward. An office that has chairs already included into the space, makes it easier and less time consuming to find chairs when guests show up unexpectedly. Stylish chairs such as these will definitely make for interesting conversation, but go with something that suits your budget. The correct lighting can make a world of difference in any office. If the lighting is fluorescent it will have that factory-like feel to it, while if the lighting is minimal it may not be great for your working situation. However, lighting needs to match the overall office decor and if you already have natural lighting streaming in throughout the day, then half your battle is won. 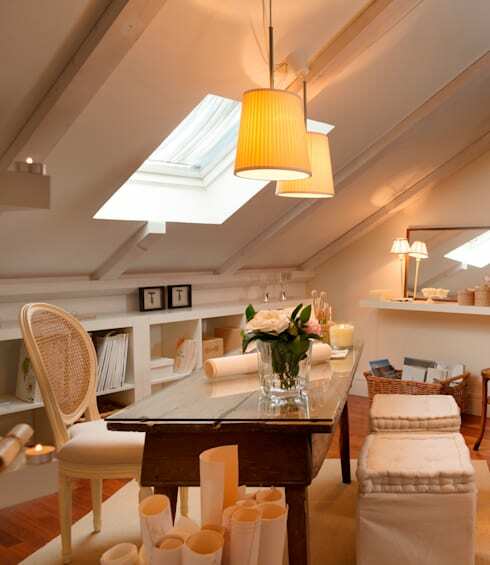 Soft lighting as seen in the image creates an intimate effect that is luxurious and opulent, but may require a desk light too for more lighting during the evenings. Adding enough lamps throughout the office, as well as some mirrors will almost double the illumination! So try that to brighten up the space. Organisation is the key in any household. Be it just for the home office, the kitchen or the kid's bedroom… everything needs its place so that the home can be perfect! 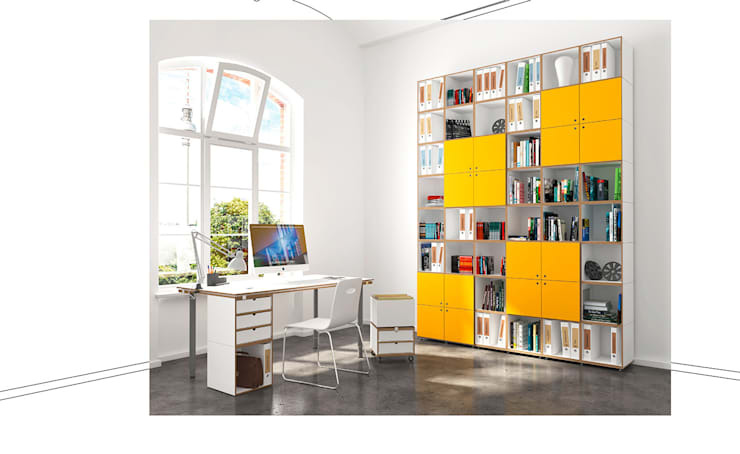 This fantastic shelving system by Stocubo will definitely take care of any storage situation, whether it be invoices and receipts of client information. Using a colour coding system will also make everything easily identifiable! So if finding your files is a problem, this may be the solution. Just ensure to file your items regularly to avoid clutter on your desk too! Organising is a high maintenance task, but just do it on a weekly basis for the best results! The home office doesn't have to be dull and boring! Add some vibrant colours, cute daily mottos and even some lively art to make it your own. 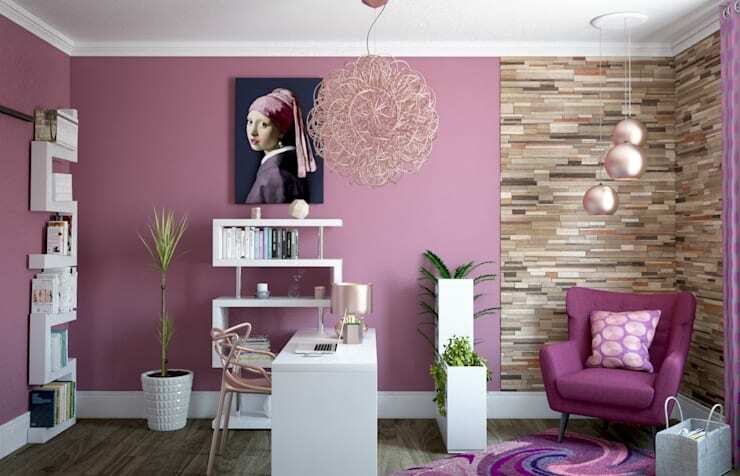 Each person draws inspiration differently and the home office should be that for you! So go with something that inspires you, whether it be a picture of a mountain you've always wanted to climb, that country you desperately want to visit, or even a beautiful print from your favourite artist, creating a space for you as an individual to work, should be the key! How about these: Cool ideas for home work spaces? Where is your desk situated in your home office?